It’s always exciting to enter a new phase of your career, but stepping outside your comfort zone can also be stressful. As I’ve gone from simply writing and editing documents at Nexight to owning projects and mapping how they will be completed, I’ve found that one project management technique has helped make my growing responsibility manageable: the Work Breakdown Structure (WBS). Done in the planning phase of a project, the WBS helps you break up a project into smaller activities. 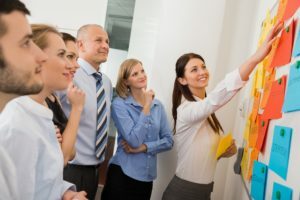 Whether you are putting together an annual report or creating a new type of tool for a client, the WBS allows you to map out what deliverables your team needs to complete, what activities need to take place to finish each deliverable, and what resources and level of effort each activity will require. All this information can help clearly define your project’s scope, ensure no tasks are missing, and avoid duplication of effort. 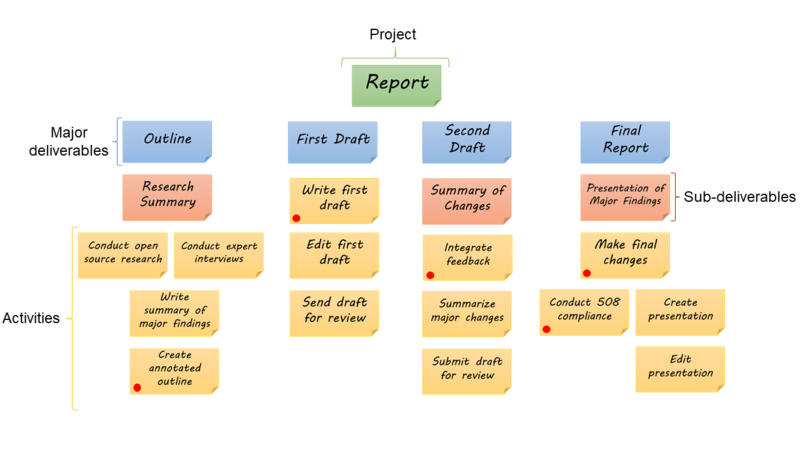 The WBS also serves as the foundation for sequencing your tasks, a key step in developing your project schedule. This will help your project run smoothly from start to finish. 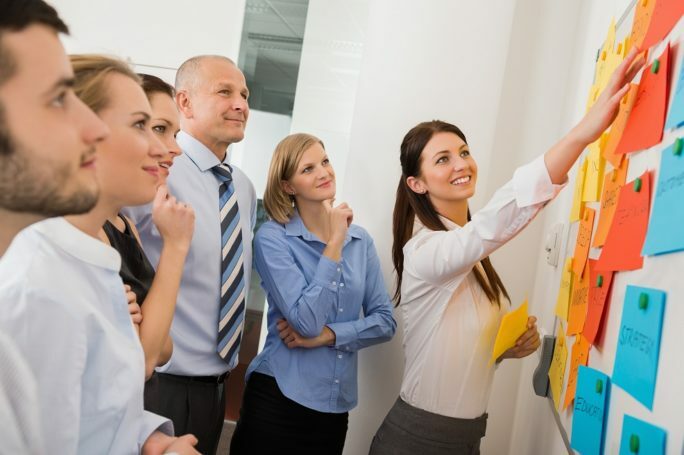 Define your project’s major deliverables: While a project typically has one final deliverable, such as a report, other products will need to be completed along the way. For example, other major deliverables (in blue in the graphic below) for a report may include an outline, first draft, and second draft before the final report can be submitted. Identify sub-deliverables: These are smaller, but important deliverables that will need to be completed. For example, a sub-deliverable (in red in the graphic) for a report could include a PowerPoint presentation that summarizes the key findings of a report. Identify activities required to accomplish each deliverable/sub-deliverable: Write out the activities (in yellow in the graphic) that will need to be performed for each deliverable and sub-deliverable. (Deliverables will most likely be nouns, while activities will typically be verbs.) For a report, creating the outline and a summary of research findings would involve conducting research, interviewing experts, writing the summary of findings, and producing the outline. A simple guideline is to break activities down until they are not overlapping and can either be accomplished by one person and/or involve between one day (8 hours) and two weeks of effort (80 hours). List the resources required for each activity: Once you identify all of the project’s deliverables, sub-deliverables, and activities, you can better understand what resources you will need for the project, such as skills or expertise, travel, materials, etc. Once my WBS is complete, I like to use it to help me create a project schedule. I start by looking at which activities can be worked on simultaneously—such as interviewing experts and conducting research for a report—and placing those beside each other in the WBS (as illustrated in the graphic). I also flag milestones, or activities that need to be completed by a certain date for a project to meet its deadlines (marked with red dots in the graphic). I then arrange the activities in chronological order from left to right to show which activities must happen before others. This information can serve as the basis for my project schedule. To learn more about project schedules and other helpful project management tools, check out a blog post written by our program manager, Kendra Chappell.